A couple of months back I reviewed the Canon G7X Mark II. The first generation of this camera had been very popular among online video creators, especially vloggers. 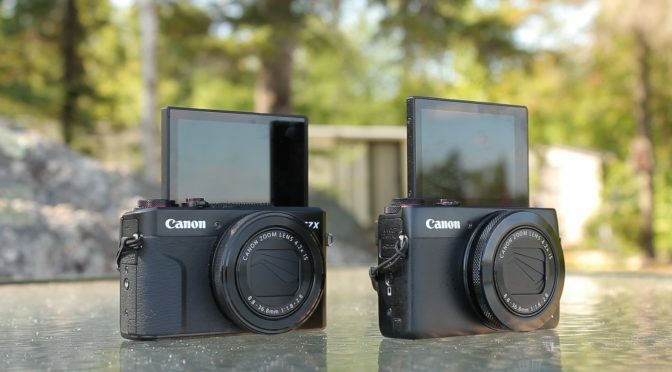 Today, I am comparing the two models to see whether there has been a significant improvement and to determine which camera offers the better value. To see my in-depth review of the G7X Mark II, please go here. It is a good idea to get extra batteries because the one Canon battery that comes with the camera will last you half a day – if you are lucky. Below are the batteries that I bought. They don’t last quite as long, but given the big price difference, you still get much better value with these third-party batteries. By the way, when you put a non-Canon battery in the camera, you will get a message asking whether this is a Canon battery. Once you click “No”, you will get another message, this one saying that Canon cannot guarantee the performance of this battery. Despite this message, I have not had any problems whatsoever. If you area going to have three or maybe even five batteries to charge (I got two of these double packs), a second charger is advisable. I really like the combo that includes the AC charger and the car charger, in addition to the two batteries, and that is what I bought.